Where I work we normally get a Christmas hamper when we go for our Christmas meal. It has always been lovely, usually really lovely goodies with a nice handmade bowl from the local pottery or something similar. But this year I thought it was exceptionally lovely! We all got a kit for making something, I chose the gingerbread kit! But there was also a breadmaking kit, a muffins kit and so on. 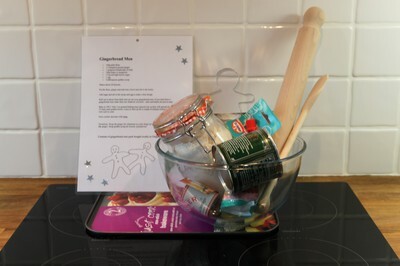 So in my kit is everything needed to make gingerbread men, including the recepie which has been laminated, a baking tray, rolling pin, cut outs, a mixing bowl and all the ingredients! Isn't that lovely! Such a good idea for a present I think. No doubt this is something I will do as a present for someone in the future. Did you get a Christmas present from work? Was it equally lovely or did it go in that pile of stuff you then recycle as presents for other people? !